Sitting down too much weakens our bodies – ESPECIALLY OUR GLUTES AND LEGS! 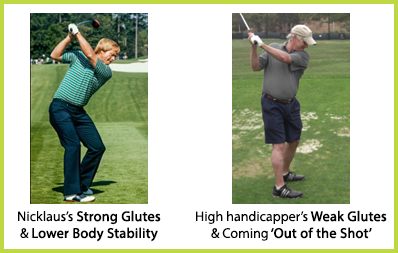 Because the Golf swing demands Upper Body Flexibility and Strengthening in the Lower Body, a person who has weak Glutes is generally going to have a hard time achieving lower body stability and be forced to rely on their arms and hands for their power and consistency. What we want in the golf swing is a combination of the Arms, Hands, Lower and Upper Bodies to be in sync with each other. Plus a strong Lower Body helps us maintain Balance and allow our Upper Body to coil powerfully against the Lower. In today’s video from The Posture System™, I’ll show you two variations on how to strengthen your Glutes and Legs with some basic squats, and also show you a modified version you can do against a wall. These can be done any time, and if you’ve noticed, I normally always end my Flexibility Programs with the Air Bench (the Assisted Squat against the wall). Next post: GET OFF YOUR RIGHT SIDE!! Roger. I have a pulled groin (R) muscle. I cut back on walking for a week and haven’t been able to play due do a sharp pain in my left hip. Seems the more I stretch the aches and pains follow. Tom, Without seeing you in person, I’d suggest that you Stop all stretching for now until the pain subsides; but do the Supine Groin Stretch for at least 20-30 minutes a side. Then, do the Castor Oil Treatment (I’m pretty sure I’ve given you this before), for at least 20-30 minutes every early evening.